Eastham is a town in Barnstable County, Massachusetts, United States, Barnstable County being coextensive with Cape Cod. You'll discover tucked-away gems like Cape Cod Provincelands Trail and Skaket Beach. Change things up with these side-trips from Eastham: Pirate's Cove Inc (in South Yarmouth) and Provincetown Public Library (in Provincetown). On the 5th (Tue), hike the day away at Cape Cod Rail Trail. 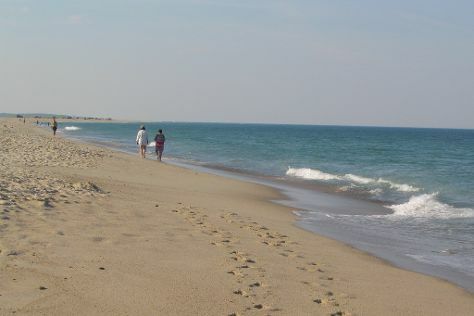 Spend the 2nd (Sat) surrounded by wildlife at Cape Cod National Seashore. Next up on the itinerary: enjoy the sea views from Nauset Lighthouse. For where to stay, photos, traveler tips, and tourist information, read Eastham travel guide. Use the Route module to find suitable travel options from Fort Lee to Eastham. Traveling from Fort Lee in July, you will find days in Eastham are little chillier (78°F), and nights are about the same (64°F). Cap off your sightseeing on the 5th (Tue) early enough to travel back home.